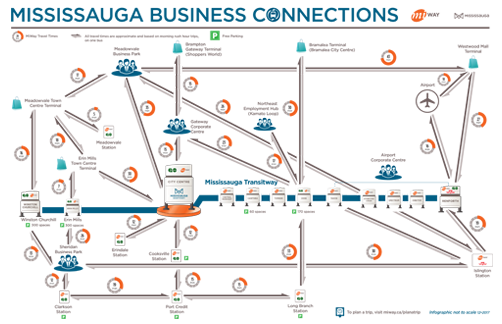 MiWay connects to Mississauga's business parks and employment areas, serving over 64,000 businesses and the over 400,000 employees that work across the city. The completion of the Mississauga Transitway connects employees in the west end of the city to the Airport Corporate Centre and Toronto Pearson International Airport, making your commute to and from the office hassle free. Click on the map below to learn more about how we're building business connections. Let MiWay be your way to work. The Airport Corporate Centre is well serviced along the Mississauga Transitway with stops at Tahoe, Etobicoke Creek, Spectrum, Orbitor and Renforth. Businesses and employees benefit from increased service connections between MiWay, GO and TTC at Renforth station. MiWay serves the Northeast Employment Hub on Route 73 - Kamato Loop with direct service from Dixie Transitway Station. The City Centre Transit Terminal offers business commuters connections to all parts of the city as well as neighbouring cities such as Brampton and Toronto. MiWay services the Gateway Corporate Centre along Hurontario Street with both MiExpress and MiLocal routes. This area will also be well served with the future Hurontario Light Rail Transit Line. With access to Meadowvale Town Centre and Lisgar GO Station, passengers can connect with several major routes servicing various parts of the city. Connect to Sheridan Business Park on MiWay from the City Centre Transit Terminal, Erindale GO Station and Clarkson GO Station.